When you've been around as long as Slotland you've got a lot of friends. The casino, which celebrated its sixteenth birthday recently, has just welcomed its 3000th Facebook Friend. Players like to share their online gambling experiences with other players on Facebook. The casino also posts special bonus offers and pop quizzes awarding free chips on the Slotland Facebook page. To celebrate its Facebook milestone, the unique casino is running another pop quiz. The quiz question is "What was the first game Slotland announced on its Facebook page?" Ten randomly selected contest entrants will get a $30 free chip. 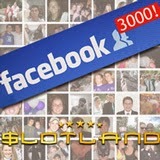 At Christmas, Slotland hid three bonus codes on its Facebook page: one freebie no-deposit bonus, a 100% match bonus and a 200% match bonus. Thousands of players found them and enjoyed some extra money in their accounts over the holidays. With its site-wide progressive jackpot currently over $150,000, Slotland is looking forward to celebrating another big winner soon and that will, no doubt, be happily discussed on Facebook!